The quantity and quality of one's social relationships have been reliably related to morbidity and mortality. A significant issue concerns the potential mechanisms linking social relationships to such long-term health consequence. Our program of research has been aimed at examining the autonomic, endocrine, and immune systems as potential physiological pathways by which social relationships influence adaptation to stress and long-term physical health. We have proposed a more comprehensive framework that specifies the natural heterogeneity that exists in social networks. This research suggest the utility of separating network ties who are purely positive (i.e., supportive) and network members that are a source of both positive and negative interactions (i.e., ambivalence - competitive friend, volatile romance). In fact, our research suggest that such ambivalent network ties are associated with detrimental influences on cardiovascular function (see refs). Our current work is specifying the pathways responsible for these associations at different levels of analysis (e.g., social-cognitive). A cross-cutting interest in my program of research has been on modeling integrative stress-induced biological mechanisms. This work has informed my research highlighted above on relationships and health, as well as related work on age-related differences in physiological reactivity to stress. The research described here was generously supported by the National Institute of Aging, the National Institute of Mental Health, and the National Heart, Lung, and Blood Institute. Uchino, B. N. (2004). Social support and physical health: Understanding the health consequences of relationships. New Haven, CT: Yale University Press. Campo, R. A., Uchino, B. N., Holt-Lunstad, J., Vaughn, A. A., Reblin, M., & Smith, T. W. (2009). The assessment of positivity and negativity in social networks: The reliability and validity of the social relationships index. Journal of Community Psychology, 37, 471-486. Holt-Lunstad, J. L., Uchino, B. N., Smith, T. W., & Hicks, A. (2007). On the importance of relationship quality: The impact of ambivalence in friendships on cardiovascular functioning. Annals of Behavioral Medicine, 33, 278-290. Holt-Lunstad, J., Uchino, B. N., & Smith, T. W., Cerny, C. B., & Nealey-Moore, J. B. (2003). Social relationships and ambulatory blood pressure: Structural and qualitative predictors of cardiovascular function during everyday social interactions. Health Psychology, 22, 388-397. Smith, T. W., Uchino, B. N., Berg, C. A., Florsheim, P., Pearce, G., Hawkins, M., Henry, N. J. M., Beveridge, R. M., Skinner, M. A., Ko, K., & Olsen-Cerny, C. (2009). Conflict and collaboration in middle-aged and older couples II: Cardiovascular reactivity during marital interaction. Psychology and Aging, 24, 274-286. Uchino, B. N. (2009). 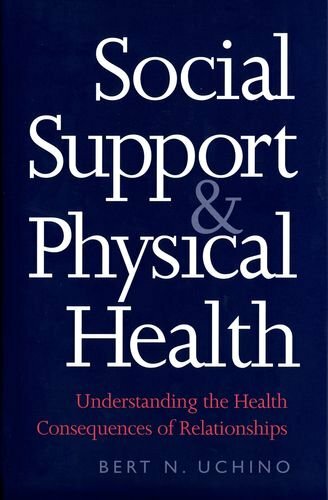 Understanding the links between social support and physical health: A lifespan perspective with emphasis on the separability of perceived and received support. Perspectives in Psychological Science, 4, 236-255. Uchino, B. N. (2006). Social support and health: A review of physiological processes potentially underlying links to disease outcomes. Journal of Behavioral Medicine, 29, 377-387. Uchino, B. N., Berg, C. A., Smith, T. W., Pearce, G., & Skinner, M. (2006). Age-related differences in ambulatory blood pressure reactivity during stress: Evidence for greater blood pressure reactivity with age. Psychology and Aging, 21, 231-239. Uchino, B. N., Birmingham, W., Berg, C. A. (in press). Are older adults less or more physiologically reactive? A meta-analysis of age-related differences in cardiovascular reactivity to laboratory tasks. Journal of Gerontology: Psychological Sciences. Uchino, B. N., Cacioppo, J. T., & Kiecolt-Glaser, J. K. (1996). The relationship between social support and physiological processes: A review with emphasis on underlying mechanisms and implications for health. Psychological Bulletin, 119, 488-531. Uchino, B. N., Holt-Lunstad, J., Uno, D., & Flinders, J. B. (2001). Heterogeneity in the social networks of young and older adults: Prediction of mental health and cardiovascular reactivity during acute stress. Journal of Behavioral Medicine, 24, 361-382. Uno, D., Uchino, B. N., & Smith, T. W. (2002). Relationship quality moderates the effect of social support given by close friends on cardiovascular reactivity in women. International Journal of Behavioral Medicine, 9, 243-262. Uchino, B. N., & Birmingham, W. (in press). Stress and social support processes. In R. Contrada & A. Baum (Eds. ), Handbook of stress science. Springer. Uchino, B. N., Holt-Lunstad, J., Uno, D., Campo, R., & Reblin, M. (2007). The social neuroscience of relationships: An examination of health relevant pathways. In E. Harmon-Jones & P. Winkielman (Eds. ), Social neuroscience: Integrating Biological and Psychological Explanations of Social Behavior, pp. 474-492. New York: Guilford. Uchino, B. N., Smith, T. W., Holt-Lunstad, J. L., Campo, R., & Reblin, M. (2007). Stress and illness. In J. Cacioppo, L. Tassinary, & G. Berntson (Eds. ), Handbook of Psychophysiology (3rd edition), pp. 608-632. New York: Cambridge University Press.